The exceptionally practical bookband we created for Athens biannual journal of curiosities, the Kennedy magazine, is a gem of a product inspired by daily life on the Académie Rodakis campus, allowing you to carry books and other loose ends with dignity. It wont hold your life together, but it sure does help the impression. The elastic textile bands are Swiss made, limited to 100 pieces in total, 5cm wide and available in two circumferences, the larger one fitting up to 4 Kennedy issues. Produced entirely in Switzerland with fully traceable bioRe pure combed and ring spun yarns using circular knitting machines our T-shirts have neither side seams nor do they twist or shrink. They’re still T-shirts, just better. 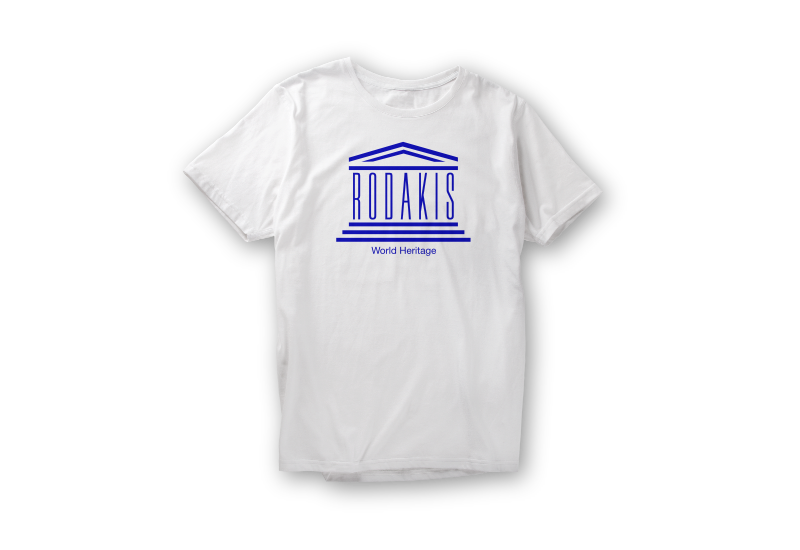 Part of our continiously growing Souvenir Line this one comes in bright white with the Rodakis World Heritage print. Backgammon is believed to have originated at around 3’000 B.C. in Mesopotamia and is the oldest known recorded game in history. It’s popularity increased again in the 1960’s due to the efforts of Prince Alexis Obelensky who organized the first Official Backgammon World Championships in the Bahamas, the winning of which became backgammon’s highest honour. Our traveler’s version designed for Pelikamo is rollable and entirely handmade in Switzerland of heavy canvas and beech wood with brass details. At an unfolded 44x55cm it’s perfect for a serious game whilst still being easier to pack than traditional cases. Ghana has a long tradition of basket weaving with a technique suited almost exclusively for round shapes. In collaboration with Accra based Kathrin Eckhardt Studio and the local weavers we developed a slightly different method for our rectangular pieces that are handwoven and dyed in Teshie. The two different sizes are available in natural and blue with the additional yellow version for SS17. Written by Bob Last and Christopher Roth, initiated and designed by Rodakis’ Pascal Alexander.